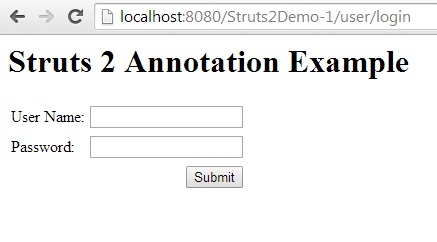 In this page, we will learn how to start with struts 2 by a simple login example using annotation. I have tried to explain step by step how to configure the struts 2 to use in our example. Struts 2 application uses action classes to process the request. Every action has a URL pattern. Action class redirects to JSP for displaying and taking input. For demo, we will run a simple login application. To run application we are using below softwares. We will start writing our code from web.xml. Define filter tag for org.apache.struts2.dispatcher.ng.filter.StrutsPrepareAndExecuteFilter. We need to pass actionPackages param . By this configuration Struts 2 scans the action classes which we create in our application. In our Login Example there will be login , success and failure screen, first for taking login input from user and rest for displaying result of login process. In struts 2, a JSP will open via an action class. So to get Login Page, we will create an Action class. Action class has an execute() method. That is executed first when the action class is called. com.opensymphony.xwork2.Action class provides keys like success and error to be returned as constant by execute() method. The annotations used in Login action are described below. @Namespace: Struts 2 gets the path of action class. @Action: Defines the names of action class to be used in URL. 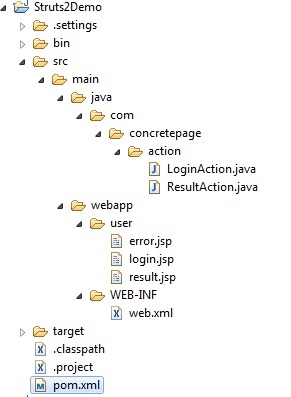 @ResultPath: Defines the path to get JSP pages. @Result: Gives the JSP page to be displayed. Now when user enters login information and submits, another action class is called. We need to provide setter getter method for those JSP field whose value we need to fetch in action class. In our example, we are fetching user name and password, so we have written setter and getter method for username field and password field of login page. To write JSP, we will use struts-tags tag library. To declare form, text and password field we need to use struts-tags library. In form tag, provide action name that will be called after submitting this page. Now find the success JSP page. Use struts-tags library to get the property from action class. Find failure JSP page to display un authorization message. Find the application structure in eclipse. To run the application, struts 2 needs the below JAR dependencies. Use URL http://localhost:8080/Struts2Demo-1/user/login to run the application. Find the Login Page. Enter any username and enter password same word used as user name, then we will get success page and if differ will get un authorization page. Find the success page after login.